A group of farmers from the dry Indonesian island of Sumba visited neighbouring Sulawesi island in March 2016 to learn from the success of farmers involved in a long-running project led by the World Agroforestry Centre (ICRAF). After a week of visits to farmers practising a range of techniques, the Sumbanese returned home full of inspiration, new skills and knowledge. Rob Finlayson talked to the farmers and found out what drives them. Sumba has one of the harshest environments for farming of anywhere in Southeast Asia. Farmers face enormous challenges: little rain, rocky and sparse soil, freely grazing livestock and not many people with the right farming skills. To help build the motivation, skills and resilience of Sumba’s farmers, the World Agroforestry Centre has been providing technical support to the Indonesia Regional Economic Development (IRED) project, which is led by Wahana Visi Indonesia (WVI) with support from the Australian Government. As part of their support, the Centre’s team in Sumba took seven leading farmers from seven villages in eastern Sumba to visit farmers in southern Sulawesi. The province of South Sulawesi has for the last five years been one of the sites of a major project led by the World Agroforestry Centre and has many examples of successful farmers who have benefited. The Bantaeng district team of the Agroforestry and Forestry in Sulawesi (AgFor) project—which is supported by Global Affairs Canada and the CGIAR Research Program on Forests, Trees and Agroforestry—welcomed the visitors from Sumba and took them to learn from farmers who had implemented a number of different techniques to improve their incomes and the environment. For example, on the second day of the trip, at Goggolo Village, Tompobulu Sub-district in the district of Gowa, the visitors were surprised to be welcomed into the village head’s home and treated to large glasses of a freshly-made turmeric herbal drink and peanut-and-palm-sugar snacks, both of which were produced from the village’s thriving agroforests. However, such hospitality was not possible in the past, explained Mulyani, the village’s head. For the farmers from Sumba, these were enlightening words. They could see and taste the results of the village’s commitment to putting to use the knowledge they gained. 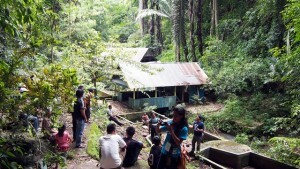 Another source of inspiration was found in a restored forest in Bonto Budung Village. Twenty years ago, what is now forest was barren land and the village was also experiencing water shortages and poor harvests of their trees and annual crops. But thanks to the leadership of Haning, who was a resident, farmer and local government official, along with the hard work of all the residents and the support of the government, 10 hectares have now been fully restored and are home to a variety of trees that provide many benefits for the community as well as visitors. Springs, which had dried up after deforestation, again have water; the village’s water supply is now plentiful and assured; and agroforests have been planted around the restored forest, acting as buffer, habitat and sources of income, food and materials. Haning was acknowledged in 1999 for his leadership by the president of Indonesia’s prestigious Kalpataru Award for the Environment. In Campaga Village, the visitors learned firsthand how to improve the productivity of fruit trees through various grafting techniques. The young farmers of Campaga also told the story behind their success. The visitors from Sumba also witnessed vegetables grown in rocky soil with limited water, talked with female farmers who also ran a successful nursery business, with male farmers who had converted their monocultural maize fields to agroforests and heard how a teacher in one village had used his private radio station to promote agroforestry. This latter initiative was complemented by AgFor’s radio programs that were broadcast throughout the province. “I have been very keen to learn what farmers here grow and carry that knowledge home and share it with others,” said Lazarus Lamboru Ndapatamu of Praibakul Village. And that is just what they did. Njaha, for example, now has a vegetable garden she grew from seeds using techniques learned from the farmers of Sulawesi and has begun planting fruit trees amidst her maize and peanut crops. Ndakajawal has started a tree nursery with his farmers’ group and a home vegetable garden from which he is already harvesting chillies and leafy greens. Bangu Kahi Nona of Mbatapuhu Village has inspired the farmers there to start fencing land from livestock and planting in the enclosed areas the tree seedlings they are producing in the nursery she also urged them to build. So that’s apparently what farmers can learn from others who have overcome similar challenges: inspiration, motivation, skills and knowledge that they use to transform their livelihoods and environment for their own benefit and, ultimately, that of all of us.